This is Ixos's top Gamma Geometry cable, the big brother of IX1. The two share many features, including proprietary Aptimus-coated conductors and the geometry, but IX2 naturally differs in several ways from its cheaper stablemate. Most noticeably, while IX1 is screened, IX2 uses an earth drain wire and as a result has significantly lower capacitance. In principle, it also has higher susceptibility to interference, but in practice we found no sign of that, and it should be suitable for long runs if the price isn't a barrier! Conductors are of oxygen-free copper and insulation is foamed polythene. 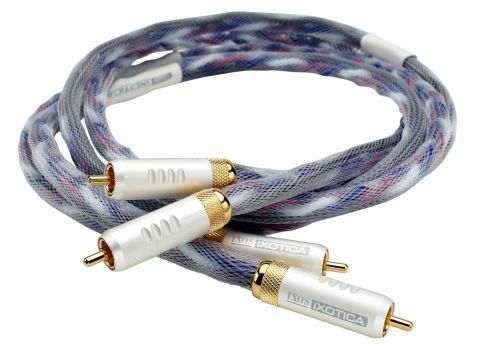 Clearly one would hope to find this cable superior to the cheaper IX1, but we weren't quite sure whether we preferred it in every way. The bass, yes, that is an improvement, combining the tunefulness and extension we found in IX1 with a more neutral, less overt, presentation. In fact if anything, the extension seems slightly better but there wasn't much wrong with IX1 in that department anyway. Midrange is also neutral, but we have some reservations about the treble, which is extended but does seem a little dry at times. As a result, there's not quite so much 'air' in the sound, less of a sense of real live performing acoustic and, almost certainly linked to that, there's less precision in the stereo imaging.